Records cataloging the healing powers of natural substances - plants, minerals, and animal byproducts - date back more than 4,000 years. There is no denying the effectiveness of traditional Chinese medicine, yet - until recently - the roots of this knowledge were largely lost in superstition and folklore. However, the use of herbs as an alternative medical treatment for many illnesses has increased steadily over the last decade, particularly since such herbs are categorized as "Natural Food Products" and are not yet subject to strict control by the FDA. Reports published in 1996 indicate that more than 10% of the US population has used herbal remedies. 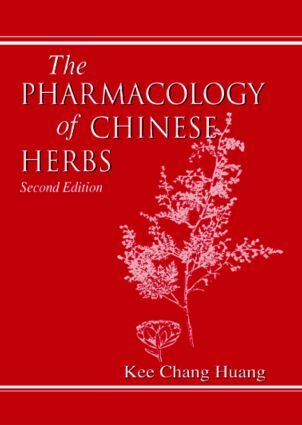 This book does not debate the value of Eastern or Western medicine but brings together Chinese herbal lore and Western scientific methods in a current, comprehensive treatise on the pharmacology of Chinese herbs. This second edition of The Pharmacology of Chinese Herbs presents the chemical composition, pharmacological action, toxicity, and therapeutic value of 473 herbs. "This well-referenced text is geared to the clinician and researcher. …There are improvements over the previous editions of this well-respected text…More specific dosages and herbs, and isolates have been added." "This valuable resource succeeds in its goal to help the Western scientist understand ancient Chinese herbal medicine from the viewpoint of modern pharmacology." "This compendium…is the definitive treatise on the subject…useful to medical researchers, physicians, historians, pharmacologists, and students." - William J. Waddell, M.D.